Meet James Raffan. Speaker, Author. Adventurer. At just about every stop along way around the world at the Arctic Circle, people gave to me, as part of their welcome, local crafts and curios, things to wear, and other mementos to help take a piece of each place home. It was only after a couple of years on the road that I came to the realization that this marvelous little collection of precious things was in itself a portrait of the people and the journey as much as my journals, photographs, audio or video recordings. Each artifact is made of local material by local hands in the tradition of the people of that place. 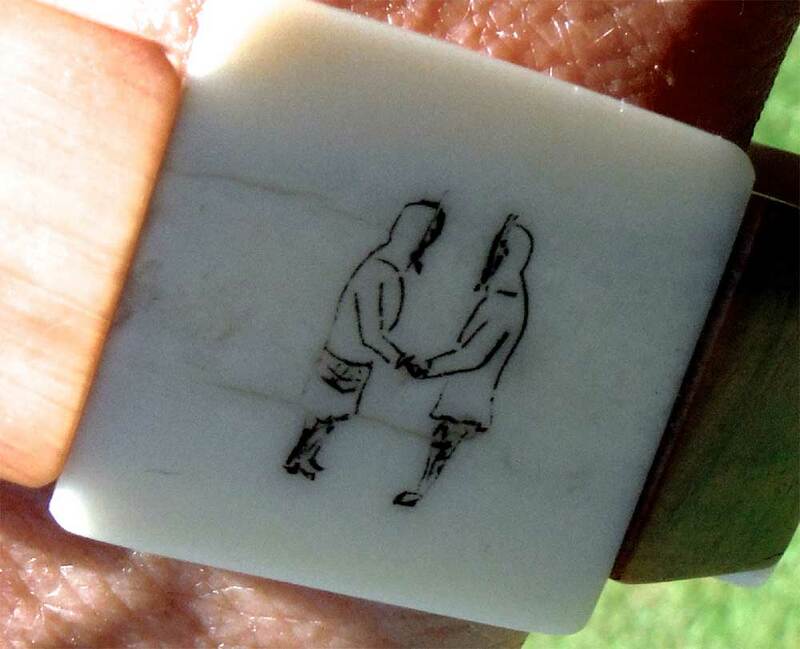 And none more beautiful or meaningful that the Love Bracelet made by Albert Olanna in Shishmaref, Alaska. Albert works with walrus tusks, both newly-harvested and fossilized, and this is material is often contrasted in his work with baleen, the fibrous material from whales harvested off the Alaskan coast. But his trademark motif are stories carved in scrimshaw into his work, hunting scenes, scenes of everyday life. 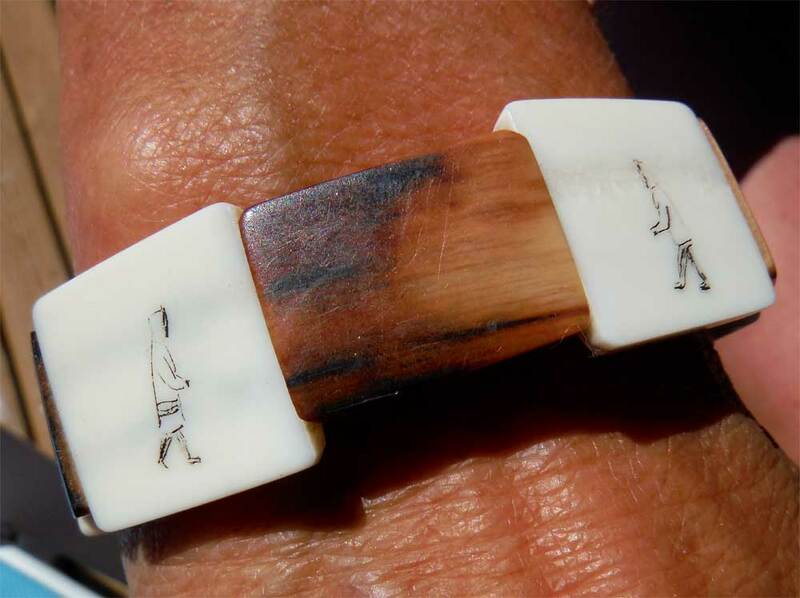 The Love Bracelet, for example, is a series of white ivory tiles alternated in tiles of fossilized ivory in a bracelet held together with elastic threaded through parallel holes drilled through each tile and knotted in an ingeniously inset mortise in the last tile in the band. And on each white tile is an image that tells a quintessential love story. Making amulets or small pieces of personal jewelery out of walrus ivory is probably something the Inupiaq people themselves have been doing for as long as they have lived along the shores of the Bering Strait. 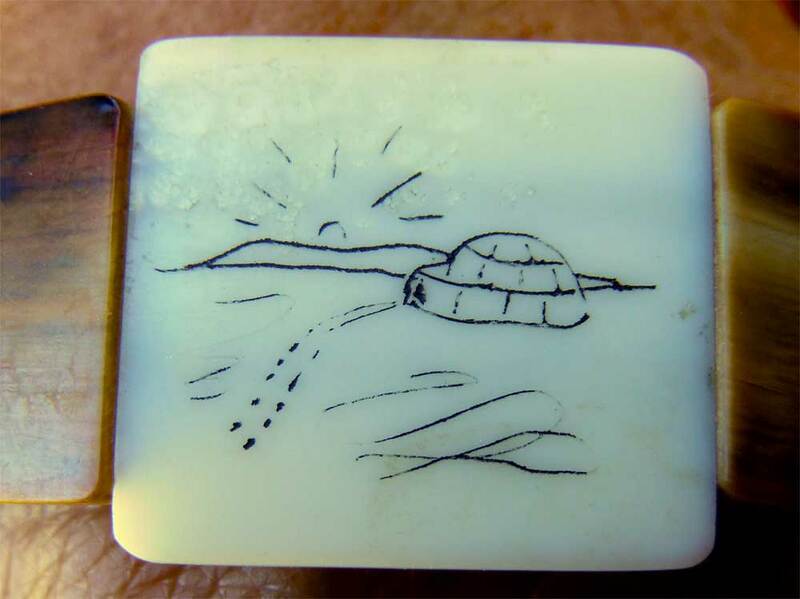 Scrimshaw, art made from scratching the ivory and rubbing into the marks stove blacking and oil or, later, ink or pencil lead, may be an art form that predates contact with Arctic whalers but it may also be a skill or a practice that marks this cultural overlap. In any case, that mix of history, culture, form and function is now something that is creating employment in Shishmaref, and just about every other northern community throughout the circumpolar world, and bringing welcome cash into the local economy. Although Shishmaref—the residents of which community Al Gore called “the first victims of climate change” because of the way their community is being eroded into the sea—was an important stop on my journey around the world at the Arctic Circle, curiously the mementos I took home from there were a live sourdough culture that was ninety years old (long story) and two exquisite masks, made of fossilized whale vertebrae, that linked to the people on the Russian side of the Bering Strait, in spite of nearly three generations of Communist division. The Love Bracelet, made by Albert Olanna in Shishmaref, came to me from Gwich’in healer and teacher, Evon Peter, who works on the coast from time to time, doing camps and workshops with young people. In a long conversation in his office in Fairbanks, I spoke with Evon about many things, including his work and his family, and along the way, I mentioned the tremendous support and love I received from my family, particularly my wife, Gail Simmons. 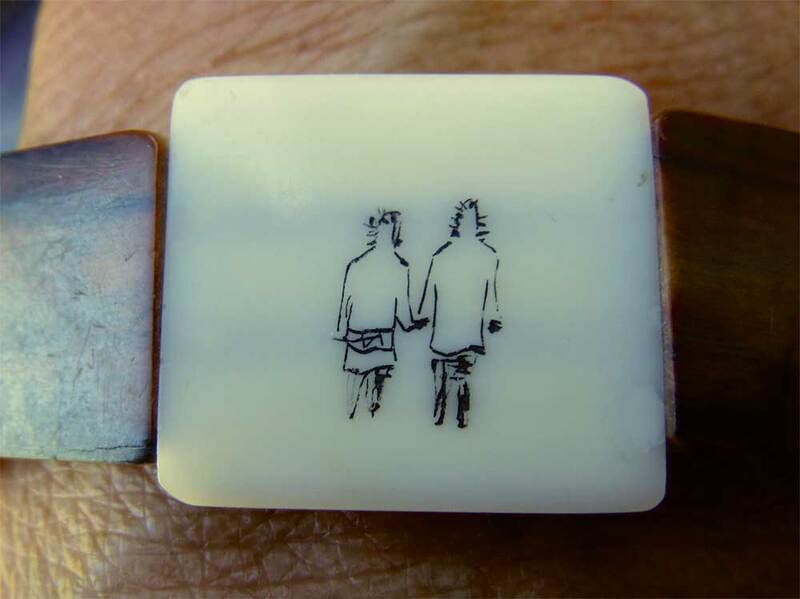 Somehow that conversation came around to the Love Bracelet, which was one of a number of handmade items Evon had gathered in the communities in the course of his work, that he sells to raise money to continue his outreach. Stories of Shishmaref and time with Evon Peter are recounted in upcoming new book, Circling the Midnight Sun (set for release by HarperCollins Canada on September 12th). The Love Bracelet and a continuing series of photographs and stories of other mementos will be uploaded over the next couple of months as a supplement or addition to the book for readers and others who may wish to delve deeper into the lives and ways of the people who live around the world at or near the Arctic Circle.